Over the last 15 years of savage war, counterinsurgents have missed a trick. Rebels, insurgents and even terrorists like Islamic State have instinctively understood that justice and courts are where the rubber of power meets the road of the people. 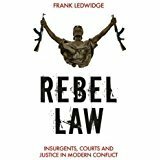 Rebel Courts not only outlines how insurgents gain a grip on societies, it looks at what counterinsurgents can do to stop them.